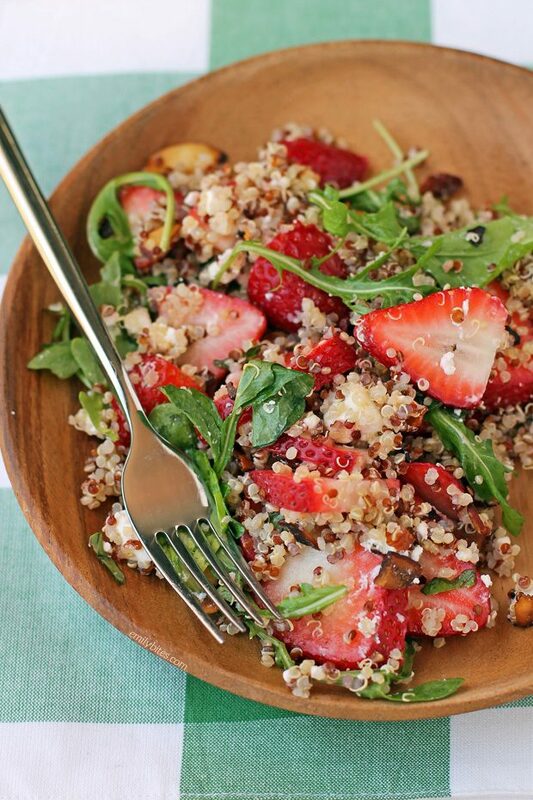 Let me tell you, this Strawberry Quinoa Salad is everything. I feel like I’m on a salad roll right now because I was obsessed with my recent Asian Sesame Chicken Salad, and now I am downright gushing over this Strawberry Quinoa Salad. It’s so fresh, bright, healthy and perfect for spring. Plus, it’s super easy and perfect for lunches – who doesn’t like that? I adapted this as a spring/summer version of my Butternut Squash Quinoa Salad (my husband’s favorite) and I like this version even better! Sweet strawberries, creamy goat cheese, fresh basil, peppery arugula, nutty toasted almonds, hearty quinoa and a bright, citrus dressing = pure perfection. I love this Strawberry Quinoa Salad as a tasty vegetarian lunch option, but it would also make a great side dish. You could even easily double or triple it to bring to a summer potluck or picnic. It’s super flavorful and delicious for just 217 calories or 5 Weight Watchers SmartPoints per serving! To make this even easier, I totally recommend cooking the quinoa ahead of time. I tossed mine into our rice cooker on the white rice setting and it turned out perfect, so if you have a rice cooker that’s recommended! Looking for more tasty lightened up salads? Check out my Asian Sesame Chicken Salad, Broccoli Salad, Roasted Beet Salad, Honey Mint Citrus Salad, Taco Chicken Salad, Avocado Bacon Corn Panzanella Salad, Antipasto Salad, Butternut Squash Quinoa Salad, Greek Orzo Pasta Salad, Harvest Apple Salad, Hummus Chicken Salad, Doritos Taco Salad, Buffalo Chicken Pasta Salad, Cheeseburger Salad, Avocado Chicken Salad, Chicken Souvlaki Salad and more in the Salad section of my recipe index! Place the sliced almonds in a small skillet and spread across the surface. Place over medium heat for a few minutes, stirring occasionally until almonds are toasted golden. Remove from heat and set aside to cool. In a small bowl, combine the olive oil, orange juice, lemon juice, cider vinegar and honey and stir together until combined. 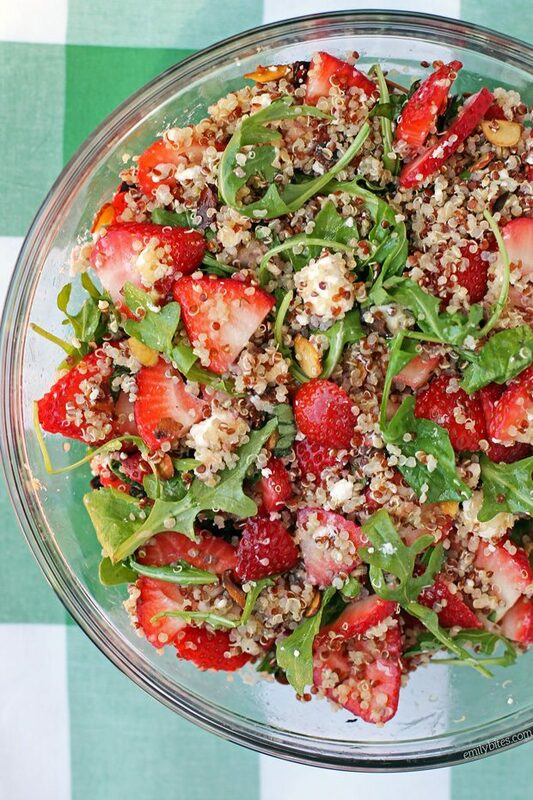 In a large serving bowl, combine the quinoa, strawberries, basil, toasted almonds, goat cheese and arugula and stir until mixed. Pour the dressing from step two over the quinoa mixture and stir until the salad is evenly coated with the dressing. Serve at room temperature or chilled. I have never eaten a salad with quinoa. I do like quinoa though. This is a beautiful dish. Bump. Need to know this too. I guess I’ll let you know what happens with mine! What would a good substitute for arugula be? I wish I liked it but I just don’t. Do you think romaine would hold up? I think spinach would be good! I took this to a family dinner and it was a hit! I made the main salad according to the recipe. However, I doubled the dressing. My sister served ribs which were delicious with the salad. Love this salad was also father approved minus the arugula. Instead I added romaine. The salad was very good. Melissa, I’m making this for dinner tonight and subbing mozzarella pearls for the goat cheese since I don’t really like goat cheese either. I expect it’ll be just as delicious! Do you think this would make and store well in a mason jar? I made this to take to a fundraising event where it was bring your own food, it was a major hit. Everyone loved it! I’ll be making this again for sure.